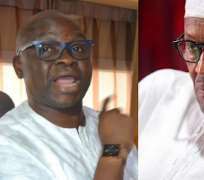 For admitting that the economy of the country was in bad shape and that Nigerians should tighten their belts, immediate past governor of Ekiti State, Mr. Ayodele Fayose has told President Muhammadu Buhari to resign and save Nigerians the agony of continuous rule by a clueless president. Fayose, who spoke on Saturday, through his Media Aide, Lere Olayinka, said "in saner climes, a leader, who admitted that he has failed and passed vote of no confidence on himself won't be seeking reelection, he will rather excuse himself and quietly return home." He likened President Buhari to a football coach, who kept boasting that he had the capacity to take a team out of the middle of the league table to the top three. The coach eventually got the chance to manage the team three and half years ago only for the team to be relegated to Division Two less than two years that he took over. The same coach is now saying the team will be relegated to Division Three next season and he wants to be retained by the club owner. The former governor said; "If after spending three and half years as President, you are still complaining that the economy is in bad shape, isn't that a clear indictment on your own govt? If by your own assessment, you have failed, shouldn't you just excuse us?" roles in the provision of several millions of direct and indirect jobs through the telecommunications industry. "For a President who boasted that he will clear the North-East of the Boko Haram insurgents within three months and make live more meaningful for Nigerians, the signs that he must take a bow and return home are clear. "Most importantly, when a President comes out to his people who have lost over 10 million jobs and are suffering that they should expect more hardship next year, such a president should be told in plain language that his time is up."